Abby Sutton is one of our more youthful organizing committee members. To inaugurate our 2014 Summit blog, here’s her invitation to other young people to join up! If you want to be in touch with Abby, please email here at: whitecoco78@gmail.com. For the last 4 years, Orly Munzing, who started Strolling of the Heifers, has been putting on a conference called the Slow Living Summit which precedes the “Stroll”. This year I’ve been asked to help bring a new perspective to the conference: that of a “young person”. No one has defined exactly who qualifies as a “young person”, we are actually trying to avoid such classification. The point is that the conference is run by and caters to people who seem to be mostly over 40 and we’re looking for a way to get people of more diverse ages interested in Slow Living. One of the cool things about the conference is that it is almost entirely run by volunteers, including participant speakers, organizers, people and companies who donate food etc. Propaganda, Marketing, and Publicity: We want lots of people to know about the Summit! You could do something as simple as forwarding this letter to people you know who might be interested. You could come to the Summit and blog about it. You could write a review….Anything. You can come to us with ideas on this. This could be a school project: If you are still in school, there is a good chance that you could get credit for whatever work you do with us. We have volunteers who are educators who can talk to your teachers and make sure it works as a school project. Or just come and see a speaker (or two, or three, or ten)! There’s also good food. The dates of this year’s Summit are June. 4-6. We do have a scholarship program available to people of all ages dependent on need. Also, If you do enough volunteer hours you can attend for free. More information about both of these options on the website. In a nutshell, Slow Living is slowing down your life. As a society, we have made huge advances in technology that enable us to complete tasks faster and more efficiently, one would think that we would have more time to pursue our own personal dream of life, right? But we don’t, we just keep going faster and faster though almost nobody knows exactly where we are all racing too. Supposedly its some place of greater happiness, equality, etc. etc. Why wait? What if we could start creating all that now? That’s the Slow Living Vision: “an Earth where humankind, honoring and celebrating the profound connectedness of all people, places and living beings, gives back by co-creating mutually supportive communities, bioregions and economic systems — and where we combine the wisdom of the past with a vision for the future to ensure a balanced, fulfilling way of life for all generations to come.” (Taken from the Slow Living Summit website: https://www.slowlivingsummit.org/what-is-slow-living/). The conference is comprised of speakers who are consciously directing their lives towards living the Slow Living Vision as they interpret it at this time in their lives, and who want to share their experiences and insights with others. Each of these speakers comes to the conference from a different angle: Wall Street investor, biodynamic farmer, teacher, visionary, theater producer. Each one believes, in their own way, that there is a more collaborative way to be living, in tune with all that is around us. Slow Living is not a mold that you squish your life into and BOOM instant happiness; it’s a set of tools to assist in building the life you want, happily, healthily, sustainably, with maximum benefit to the whole (which, by the way, you are part of). Slow Living can be applied to anyone’s life, people of any age, race, gender, or means can begin to live slower. A key part of Slow Living is awareness. It’s hard to be conscious of what’s happening around you when you’re rushing around trying to do everything on your list today and your mind is already worrying about what you have to do tomorrow. Sound familiar? Slow Living can teach you how to become more aware of the current state of your life and also where you would like to go from there. Slow Living asks us to look at the input and output of energy in our lives. Energy is a very flexible term. It can be applied the amount of electricity that you use and the gas in your car, and to the amount of time you spend making food or writing that huge essay. By being aware of the energy flow in your life, you can direct it more efficiently and accurately where you want it to go. Another aspect of awareness is to become more aware of your impact on your community, and the earth as a whole. Impact is not necessarily a bad thing, though people often talk about “lessening your impact”. You can make positive impact too, and we don’t want to lessen that. Slow Living can help you form ideas for how you can make a positive impact. But let’s say that you are a very busy person, enjoy being busy, and don’t want to get rid of any of your projects. You can still apply Slow Living to your life. What if you took public transit when possible? Shopped at a local farmers market? Installed solar panels instead of using electricity? You can apply Slow Living in that way and keep your busy schedule. We aren’t trying to go back to the Stone Age. This is an age of technology, but how can we use that technology to enhance our lives in a more thorough and actually fulfilling way? Recently, an app was made that allows people to connect with other travelers in their area and set up carpools. Technology is not a bad thing. It’s a tool. How can we use it? You might be looking at me a little funny right now, because I am writing this to other people my age, or of similar age, and some of my suggestions might not work for you. Well that’s why I’m writing to you. We want to make the conference this year more accessible to younger people, who might not get to choose where they shop, or who do but “the supermarket is way cheaper and I am not rich!” Who might still be stuck in school five days a week- “I don’t have time for any more extracurriculars.” Who don’t even have a car- “so why am I worrying about gas usage?” Slow Living is something that can theoretically be applied to anyones life. Since all lives are different, said application is going to be different for each one. Even if there isn’t anything you can do right now in your life, now is when you start planning for the future. Slow Living could factor into that plan. Change often takes a long time to take hold. Your personal version of Slow Living is an ever changing, ever growing, ever evolving vision, so why not start now, even if you won’t be able implement your ideas for another few years. Plan well, and plan slowly. This year, we want a lot of people of different circumstances all in the same place talking about how Slow Living can be applied. Whether you have questions, answers, or a few of both, we could use your help. Thanks for reading! Feel free to contact me- by email or leave a comment. Abby is 18 years old and lives in Guilford, VT. She has been volunteering for the Strolling of the Heifers and Slow Living Summit for one year, mostly doing writing and the occasional organizational job. She completed her GED in Nov. 2013 and is now trying to learn about lots of interesting things while avoiding traditional school. As someone who is interested in permaculture, sustainable agriculture, and just generally creating a more holistic approach to life, working for SOTH and SLS has given Abby opportunities to pursue her interests while supporting an organization whose mission she agrees with. 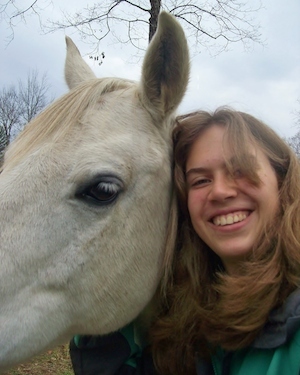 In addition to volunteering, Abby spends time reading, doing art of many varieties, and hanging out with her horses, Orian and AJ, or her cat, Mittens.